Lightning strikes can cause significant damage and major expenses for surveillance systems. An unprotected camera hit by lightning cannot only kill the camera but lots of other devices connected to the camera (switches, recorders, etc.). In this note, we examine lightning protectors, their cost, usability, when they are needed, types to consider and how they should be installed. Most commonly, integrators install lightning protection on cameras mounted near the tops of buildings, on poles, outbuildings, or other highly exposed locations. When located on a parapet mount atop a building, a camera essentially becomes a lightning rod. Cameras mounted lower on a multi-story building, they are not considered to be as exposed as higher cameras, but may still be subject to lightning-induced transient currents. Some designers insist that lightning protection should be installed on all outdoor cameras, regardless of mounting location. However, given the cost of protectors, $50-100 per camera, which can be a ~10% increase per fixed camera, this is often not done in practice. Notice how Florida is ~16 more likely to suffer lightning strikes than NYC and how rare lightning strikes are in most of California. 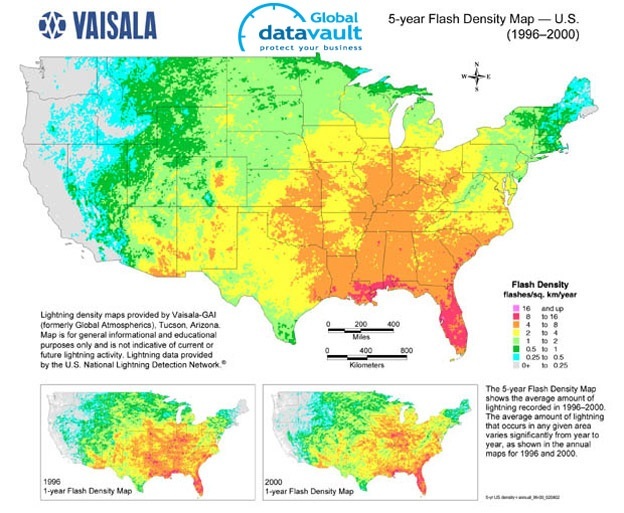 Reading such maps can help better gauge risks. And, of course, experience in a region with past cameras will provide an even more specific sense of the risk of lightning strikes. Note that contrary to popular belief, lightning protection is not intended to prevent the camera or other connected device from being destroyed by lightning. If lightning strikes a camera, that camera is mostly likely going to be destroyed. 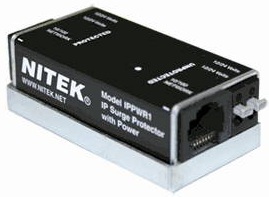 Instead, the protector is intended to prevent connected electronics (switches, routers, NVRs, etc.) on the protected side from being damaged. From a performance standpoint, it is normally preferable to install lightning protection closer to the camera, making the path to ground much shorter than the protected side of the cable run. If the cable run is too short, it may provide less resistance than preferred, reducing the effectiveness of the lightning protector. Care must also be taken when installing single-port surge protectors, as electrical codes typically prohibit exposed connections in ceilings, so surge protectors must be installed in a separate enclosure. Mounting protection near the camera also requires more installation labor, as a grounding point must be found for each camera, which may or may not be readily available.